Ever seen someone smiling at you with beautiful white teeth, supported with a splash of bright pink gums? Most people are concerned about their appearance, so they take real good care about their teeth. But what they fail to realize is that beneath those strong white tusks of theirs lies a supporting structure that holds their teeth in place, allowing them to be used for chewing efficiently. These supporting structures serves as pillars to the whole dentition structure in the mouth, just as how tall skyscrapers are supported by strong pilling underneath them. The fundamentals to a good oral hygiene and healthy teeth starts from your gums. Your bone and gum tissue should fit snugly around your teeth like a turtleneck around your neck. They provide comfort, shelter and a cozy home for your teeth to live in. It is a very peaceful and harmonious neighbourhood providing a soft cushion blanket around your teeth. 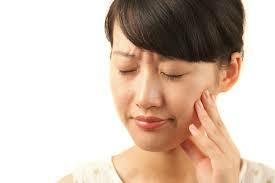 HOWEVER ... when we have gum disease, this soft cushion around your teeth becomes painful and red. It will cause discomfort to your teeth and if not treated, this lovely comfortable home for your teeth might get jeopardized. This is brought upon by destruction of the underlying supporting tissue and bone , forming "pockets" around the teeth. What was once a beautiful home is now a wrecked warzone with disease and dead cells. But it does not stop there. Over time, these pockets become deeper, providing a larger space for bacteria to live. As bacteria develop around the teeth, they can accumulate and advance under the gum tissue. These deep pockets collect even more bacteria, resulting in further bone and tissue loss. Eventually, if too much bone is lost, the teeth will need to be extracted. So much for the beautiful white teeth we were safeguarding all this while. Now that I have got your attention regarding healthy gums, let us discover what gum disease is all about and why does it happen. There are many kinds of gum disease. Knowing what they are and their underlying causes might help us understand gum disease better. The mouth is a very complex structure, it comprises of both hard and soft tissue supporting each other in an equilibrium. The fundamentals of healthy gums is keeping a good oral hygiene and preventing the formation of calculus ( hardened, calcified food, a.k.a. Plaque ). Accumulation of plaque, a sticky soft layer of slough over tooth surface, usually approximated close to the gums (cervical area) over a period of time could cause swelling of the gums. That is the primary indication of a gum disease. 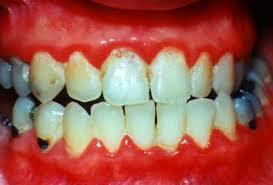 The 1st type of gum disease is Gingivitis. 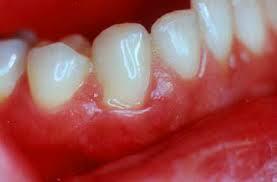 GINGIVITIS simply means inflammation of the gums, ( gingiva - gums, itis - inflammation ). It is the mildest form of periodontal disease. It causes the gums to become red, swollen, and bleed easily. There is usually little or no discomfort at this stage. 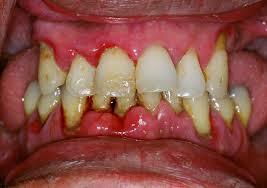 Gingivitis is often caused by inadequate oral hygiene. Good news is Gingivitis is reversible with professional treatment and good oral home care. 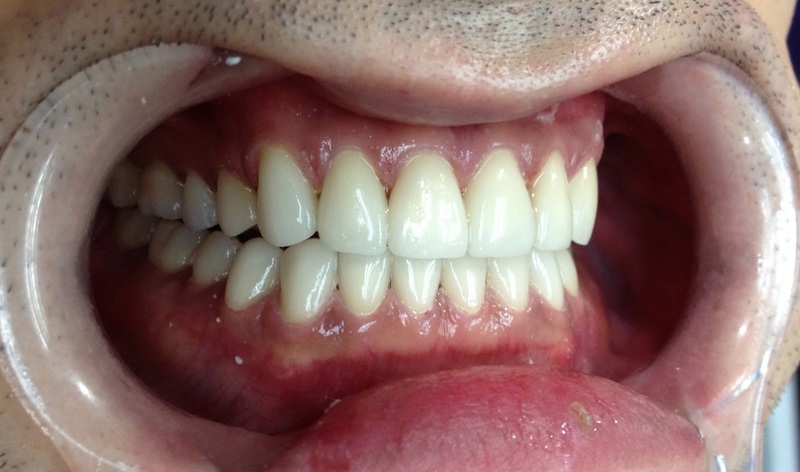 If gingivitis it's left untreated and persevered over a period of time, it will deteriorate and affect the underlying supporting tissues-causing periodontitis. Periodontitis ( peri - around, odonto - dental tissues, itis - inflammation ) is an inflammation and destruction process of the periodontium tissue, such as the cementum (overlying structure that protects the roots), the alveolar bone (base that the tooth sits on-the bone socket), the periodontium ligament ( tissue fibers holding the tooth in its place, prevent a tooth from dislodging or moving on an otherwise healthy tooth, also known as the shock absorbers to reduce impact on the tooth ) , and finally the gingiva ( gums ). Any destruction to these tissues could result in mobility of the tooth, gum recession-leading to sensitive teeth, tooth ache-due to bacteria colonies brooding in the calculus, causing pain due to the inflamed supporting tissues, bleeding of gums during brushing, and leakage of the seal between the oral environment filled bacterias and the sterile tip of the root, resulting in abcess formation. 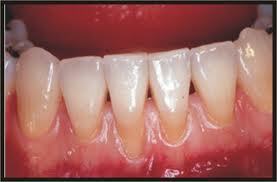 Periodontitis is a result of a longstanding gingivitis that is left untreated. It all starts of with poor oral hygiene, where bacteri colonies start to dwell within the gums, causing minor swelling on your gums. WHAT ARE THE RISK FACTORS ??? It is very important to identify the predisposing factors for gum diseases. Elimination of the source of infection is better than treating it. Get to know your risk factors. 1. Hormonal changes in girls/women. These changes can make gums more sensitive and make it easier for gingivitis to develop. also negatively affect the health of gums. 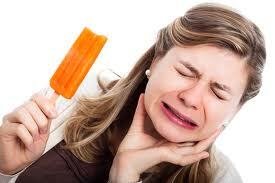 medications that can reduce the flow of saliva, which has a protective effect on the mouth. Without enough saliva, the mouth is vulnerable to infections such as gum disease. And some medicines can cause abnormal overgrowth of the gum tissue; this can make it difficult to keep teeth and gums clean. disease than others. Back to top Who gets gum disease? People usually don’t show signs of gum disease until they are in their 30s or 40s. Men are more likely to have gum disease than women. Although teenagers rarely develop periodontitis, they can develop gingivitis, the milder form of gum disease. Most commonly, gum disease develops when plaque is allowed to build up along and under the gum line. More teeth are lost through gum disease than through tooth decay. Gum disease is likely to strike anyone who neglects oral hygiene or eats a poor diet. Particularly at risk are people with alcoholism, malnutrition, or AIDS/HIV infection or who are being treated with steroid drugs or certain cancer chemotherapies. Regular brushing and flossing help to prevent puffy, sore, and inflamed gums. It is important to know when to expect gum problems if we understand the causative factors. We have to first rule out the involvement of any sistemic disease that could possibly cause the gum condition. This can be achieved by a good history taking and clinical examination, followed by blood tests, histopathological examination of biopsy, and medical consultation. Well, this introduction to GUM DISEASE is to educate us all about the heritage we own and how important it is to maintain and preserve it. There is much more to the gums and teeth than we think we know. This is yet merely tapping into the depth of dental science, of which we should be aware of. In the next volume, I shall discuss further about the types of gum diseases, the cause and impact on an individual, and also the solutions available to curb this disease. 5. EAT RIGHT – a healthy diet always brings about positive results to the body ! For any further inquiry, please visit WWW.MALAYSIACOSMETICDENTIST.COM , or you could contact me at dryogeshbds@yahoo.com .